Presented in recycled cotton paper envelopes. 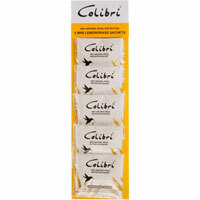 Avaialble in three sizes, mini, standard and hanging sachets. Also available in Lemongrass or Cedarwood. 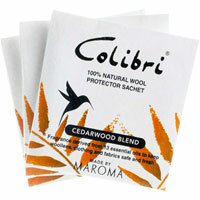 Protect your woollens - even cashmere - with these fragrant sachets infused with essential oils. 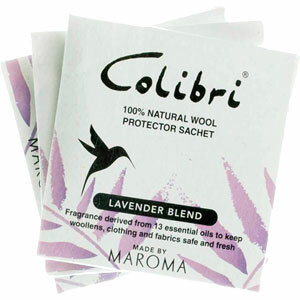 These sachets create a cocoon of natural protective fragrance which will keep wool, silk and other precious fabrics safe. These wonderful products repel insects in a completely natural manner while offering a very pleasant alternative to chemical repellants. Each fragrance is blended from several natural essential oils and botanical extracts and the light fresh aroma sends a fragrant message to the most bothersome insects (flies, moths, mosquitoes and fleas) to keep away. All the sachets are hand produced and packed in a recycled cotton paper envelopes. Use all year for maximum protection and replace every six months. 100% natural botanical essences from Vetiver, Eucalyptus, Clove and Lavender Oil. They contain no chemical insecticide or toxic ingredients and are absolutely safe. Packaged in recycled cotton paper. Hand produced with care for the environment and concern for social development in Tamil Nadu, India. Non toxic & Cruelty Free. Packaged in hand made cotton paper. Choose from Lavender, Lemongrass or Cedarwood. These wonderful products create a cocoon of natural aromatics which will keep wool and other fabrics in mint condition. 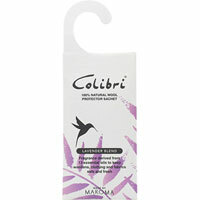 Colibri’s natural formula, which was developed by Maroma for use in closets and other storage areas, freshens and preserves with light, clean natural fragrances. For optimum results the sachets should be used year round and replaced every six months. The base formula contains essential oils and botanical extracts of eucalyptus, clove, lemongrass, vetiver lavender and cedarwood. Added Lemongrass or Lavender oils are used to form each of the fragrances we offer. 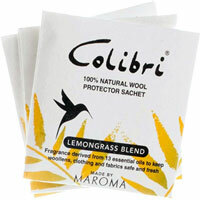 The products protect clothes against moths and keeps drawers & cupboards smelling fresh and clean.